As some of you have probably noticed, I recently took an interest in Bitcoin. I was looking for an alternative form of payment for the website and thought I would give it a try. I’ve learned a lot and have become fascinated by crypto currency. The good news is if your not into Bitcoin, I probably wont be posting about it here anymore. I’m sure there will be a mention from time to time but for the most part I will only be posting about the crypto currency here. If your into Bitcoin and bitcoin related things check it out ! This entry was posted in Bitcoin, Blogging, updates and tagged bitcoin, blogging, update, updates on March 29, 2014 by NewAeon. I love giving you guys freebies ! I’ve been doing a lot of work with Bitcoin related stuff, and came across this lovely Bitcoin icon set. The file is in zip format, and contains both jpg and svg files. This is a lovely icon set, and is perfect for different Bitcoin projects you may find yourself working on. The pack is available for download here. This entry was posted in Bitcoin, freebies, graphics, icons and tagged bitcoin, freebies, graphics, graphics pack, icons, jpg, svg on March 10, 2014 by NewAeon. I recently started getting into the Bitcoin. I originally was looking for an alternative payment system, but now the more I learn about it the more it really intrigues me. I love the concept of a decentralized world currency designed for use on the internet. I also think the way the market fluctuates is very exciting. Bitcoin goes up, it goes down, buy low, sell high , you can really get caught up in all the excitement. I realized there’s a little more to accepting Bitcoin than to just accept Bitcoin. So I’m trying to learn everything I can about the crypto currency. As I’m learning I’ve been taking notes, and I decided I may as well design some webpages around the topic. So I created a Bitcoin subdomain for New Aeon, and I’ll be adding pages as I learn. Finally, I already started making money with Bitcoin, and decided to create a page of opportunities that actually work. So as I try out different Bitcoin opportunities I’ll list them on the web page with a short description and how it all worked out. For now I added a bunch of Bitcoin faucets that I already got paid on. If your into Bitcoin faucets and free Bitcoin, click here for the page. This entry was posted in Bitcoin and tagged bitcoin, bitcoin faucets, bitcoin pages, faucets, free bitcoin on March 6, 2014 by NewAeon. Just a quick March update and some up coming news. Things are moving quickly in 2014, and the blog is slowly growing. Thanks to all the new sign ups, followers, and folks following the rss feed and the various social networking sites that New Aeon Design is on. I plan on getting a lot more tutorials up shortly. Expect some Gimp stuff, and Inkscape stuff coming soon. I’d also like to add some html and css code as soon as I can find some time. I got my first graphics pack up on the main website. It’s a trippy, psychedelic graphic pack of seamless backgrounds and textures for website backgrounds or any trippy graphics projects you might be working on. 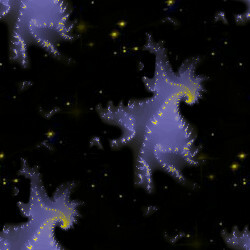 The project was a lot of fun to work on, and the designs were created by running various fractals through different filters and adding different backgrounds like stars and stuff. The graphic shown is one of my favorites from the set, feel free to use it and if you do and you like it why not consider downloading the rest of the pack . The pack is available for only $1.95 and can be downloaded instantly through payloadz. The file is in zip format, and the images are 250 x 250 px in jpg format. I’m also working on a way to incorporate Bitcoin payments for all you crypto currency fans. On that note , you may have noticed the Bitcoin tip jar on the sidebar. I decided to get involved in Bitcoin a little. I’m a bit sceptical of the crypto currency but feel that it’s worth getting involved with as an alternative payment method. I think eventually a decentralized crypto currency for the internet is inevitable, and I’d like to learn as much about it now, than later when I’m trying to play catch up with everyone else. So, I’ll be posting about Bitcoin from time to time and I have a few surprises in store for fans of the crypto currency. With all that said, thanks again for following and supporting The Design Blog. I’m gonna get creating some content now. Hope you check out my first graphics pack, and I’ll talk to ya all soon ! This entry was posted in Bitcoin, Jibber Jabber, updates and tagged bitcoin, graphic packs, jibber jabber, news, payloadz, update on March 3, 2014 by NewAeon.